Bloomsbury has sent over the cover for the illustrated edition of Harry Potter and the Prisoner of Azkaban. Once again Jim Kay does beautiful artwork showcasing the Knight Bus. Pottermore have also posted a few additional illustrations that you can see in the gallery. The book will be published in hardback on 3rd October 2017 (£30)and a Deluxe edition will also available (£150). 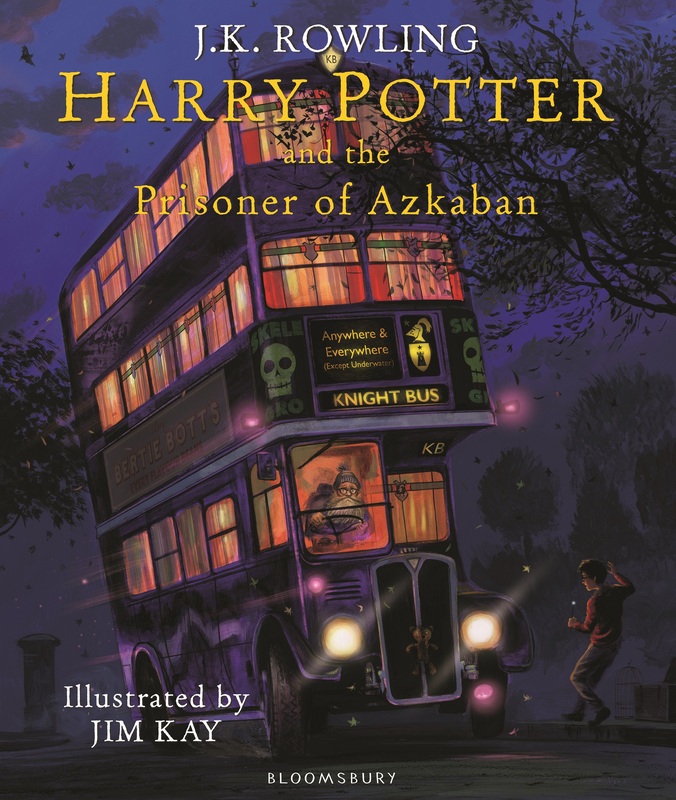 Bloomsbury Publishing is excited to reveal the cover of the eagerly anticipated Harry Potter and the Prisoner of Azkaban Illustrated Edition written by J.K. Rowling, illustrated by Jim Kay. Illustrated by Jim Kay, Kate Greenaway Medal winner, the front cover image shows the iconic triple-decker Knight Bus that whisks Harry off to Diagon Alley at the beginning of the book. Published globally on Tuesday 3rd October 2017 the hardback edition will include ribbon marker, head and tail bands, illustrated endpapers and over 115 colour images. The illustrated edition will be published in more than 21 languages around the world. All will be using Jim Kay’s artwork and will join together to bring this beautiful edition to life. Harry Potter and the Philosopher’s Stone Illustrated Edition was published to huge acclaim in October 2015. Sales of the book exceeded 100,000 copies through UK TCM within the first six months of publication and the book was shortlisted for The Bookseller Children’s Book of the Year. Harry Potter and the Chamber of Secrets Illustrated Edition followed in October 2016 and hit the No.1 position in the official UK Children’s TCM Chart. Jim Kay’s inspired reimagining of J.K. Rowling’s classic series has captured a devoted following with over one million copies sold worldwide. Pottermore, the digital heart of J.K. Rowling’s Wizarding World, will exclusively reveal extra artwork from Harry Potter and the Prisoner of Azkaban Illustrated Edition at 12:00pm on Tuesday 7th March 2016. Visit Pottermore.com to see more of Jim Kay’s beautiful art. The Harry Potter novels have now sold over 450 million copies worldwide and have been translated into 79 languages. Harry Potter and the Philosopher’s Stone was voted the nation’s favourite children’s book in a 2013 poll by reading charity Booktrust and celebrates its 20th anniversary in 2017.